Danila Fialkovsky from St. Petersburg was named one of the winners of the largest pre-college science award in the world. Danila Fialkovsky of St. Petersburg’s School 564 was named one of the winners of the Intel International Science and Engineering Fair (ISEF), the largest pre-college science award in the world, known as the “Little Nobel Prize” in the Russian scientific community. 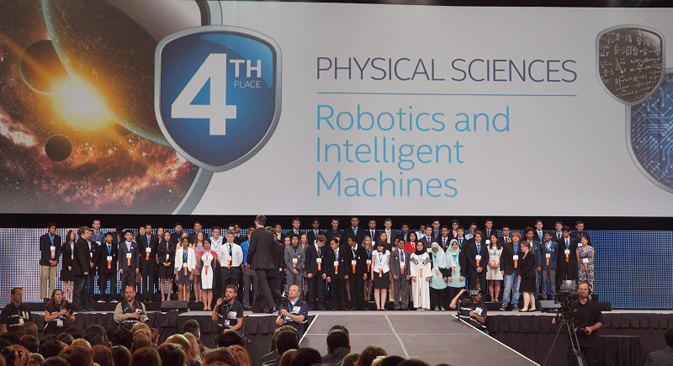 According to a representative from the Continuous Mathematical Education Laboratory (LNMO), which Fialkovsky attends as part of his extracurricular activities, the 11th-grader received a Grand Award at ISEF on May 15, 2015 in Pittsburgh, U.S.
“Danila showcased his project called the ‘Fast Algorithm of Commutator Length Computing in Free Group’ competing against 1,700 participants representing 75 countries,” a representative from LNMO said. The project won him an award for fourth place in the category of mathematics with a cash prize of $500. The representative said that the 17-year-old student spends eight or more hours a day studying, attends mathematics summer schools and has taken dozens of various courses on mathematical analysis, algebra and topology. Already something of a young science star in Russia, Fialkovsky was the winner of the Junior National Science Fair held by Moscow Institute of Physics and Technology, which earned him a place on the Russian team participating in the Intel ISEF 2015 competition. The team also included six other LNMO students. According to the LNMO press service, the projects showcased by the young Russian mathematicians were judged by “world-famous scientists, Nobel Prize winners and representatives of the leading universities of the world.” Danila became the 29th ISEF winner from LNMO.